If you&apos;re looking for a genuinely authentic gift that&apos;s as affordable as it is unique, then you&apos;ll want to mark down the second Saturday of June, July and August on your calendar and visit the Danville Handmade Market. Located on the east side of the Historic Courthouse Square in Danville, the market is open from 8 a.m.-1 p.m., June 13, July 11 and Aug. 8. 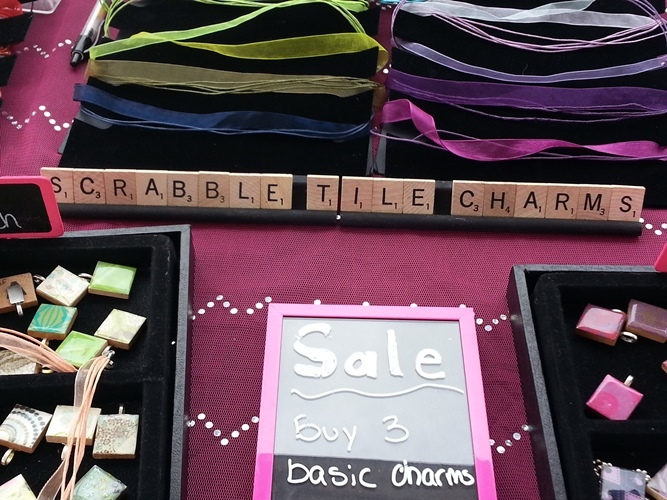 Organized by members of the Hendricks County Arts Council, the Handmade Market features everything from jewelry and soaps to charms - made from Scrabble tiles, bird feeders and much more. The popularity of handmade markets is exploding across the country. Combining art and handmade crafts, the markets are the product of what is known in craft circles as the Maker&apos;s Movement. In Danville, the popularity of the market is so strong that there is a waiting list of vendors just trying to participate. And, that&apos;s with publicity coming almost exclusively through social media via Facebook and Pinterest and websites such as Etsy.com. I visited this year&apos;s first Handmade Market in May and found it to be a place where the stories behind the products are as fascinating as the various artists who were there to proudly promote the items they were selling. I met Jessica Stone, owner of Enjoy the Small Things & Gifts. 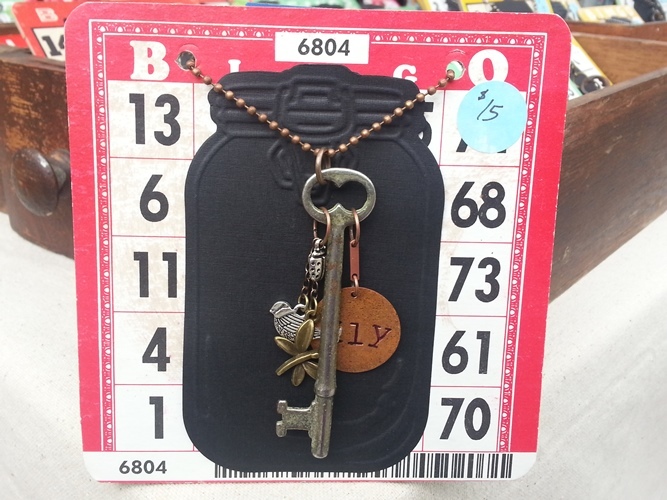 A talented preschool teacher from Veedersburg, Ind., she offers a nice selection of pendants, earrings and key rings, all of which have been created using the scrabble tiles. She loved the game growing up and looking through the wide variety of items she had on display, you couldn&apos;t help but notice the passion she puts into each piece. Her website can be found here. One of the other gifts that caught my attention -- and my pocketbook -- were the bird feeders from Matthew Borden a.k.a "Bird Feeder Guy". 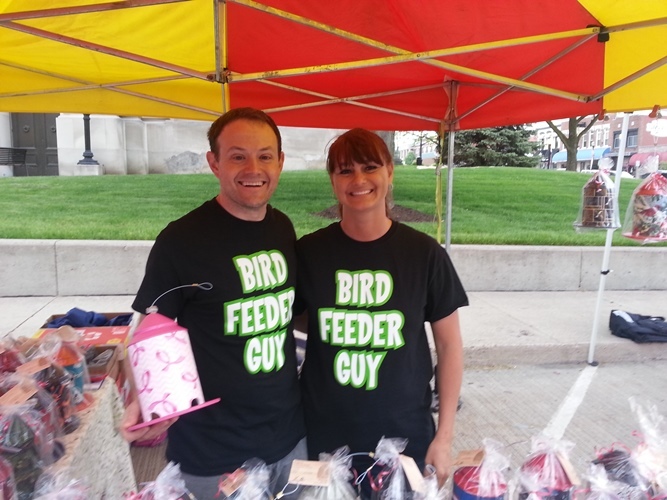 Together with his wife, Stacie, he designs and sells an array of branded, gravity-fed bird feeders using PVC material and a metal top that he engineered. He builds the bird feeders in his garage and many of the styles feature everything from decorative and scenic designs to all sorts of professional sports teams and colleges/universities. For my wife, I found an Ohio State Buckeyes-branded feeder that was a perfect addition to her backyard garden. He&apos;s happy to create a custom order for you. You can learn more about the Bird Feeder Guy here. Rounding out my visit to the Market is the first place I visited -- Joanie&apos;s Junque. Joanie Relf fashions skeleton keys into necklaces. But what makes her gifts charmingly unique is how they&apos;re displayed. She uses vintage Bingo cards to mount each necklace, but to make it stand out, she added a black silhouette in the shape of a mason jar. Not only does it add a classic touch to how the necklaces are displayed, but to be sure it&apos;s a conversation piece as well. She said she routinely is on the lookout for skeleton keys to keep up with production. She&apos;s even willing to pay $3 or $4 for the keys, noting that a key that&apos;s at least 3 inches in length is the best kind for creating the necklaces she sells. And, the bingo cards? Mostly, they come from places, such as Goodwill. I just scratched the surface of all there is to see and do at Danville&apos;s Handmade Market. Be sure to visit this unique event monthly this summer during the Rural Routes to Main Street Cultural Trail&apos;s Second Saturdays. From week to week, some of the vendors do change, adding to the variety of the gifts and artwork you&apos;ll see. But whether you have an appreciation for fine art or handmade gifts, you&apos;ll want to get over to the Danville Handmade Market and discover the treasures that are on display.